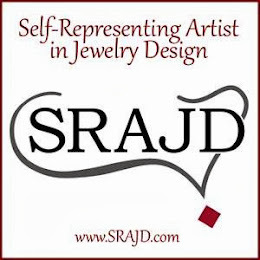 Generally my blog is about my adventures in jewelry making, thrift shopping, my family and things I like to eat and don't forget... things I find on Pinterest. So today, I just want to briefly talk about my faith. Eight plus years ago my husband and I and our family converted to Catholicism. It was not easy, as our families were opposed, but for us it was the right decision and once we made the leap it was the piece of the puzzle that had been missing all along. Being Catholic is like an onion, there are many layers and it becomes more interesting the deeper you delve into it. I read many books when I first began this journey. I started as a nominal, protestant Christian, the more I read, the more light bulb moments I had. All the things in the bible I'd questioned and wondered about started to make sense and began to click for me. The one thing that took me awhile to comprehend however, was the devotion to Mary. I understood it superficially, but not having grown up in that way it has taken me a few years now to understand and feel that love in my heart. When you think about what she did and who she was it is truly remarkable. As a very young woman, she said 'YES' to God's will despite, fear of the unknown and the way her society would see her. 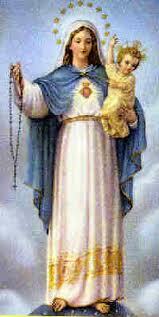 She conceived through an immaculate conception and gave birth to the Son of Man and yet also God. Then at the base of the cross she became the mother of us all by Jesus' command. Not many humans are up to that task are they? What finally 'sold me'? The moment I realized...who better then, than a mother to lead you to her son? A mother, will lovingly and patiently tell you all you need to know and more. So in my effort to understand Jesus more fully, and also to incorporate a daily devotion into my life. I am planning to pray the Rosary every day in the month of October. You can learn more of the history of this devotion here. I have adopted the multi-denominational group Food for the Poor as my charity these last couple of years and sell rosaries and decorative crosses with all proceeds going to this group. 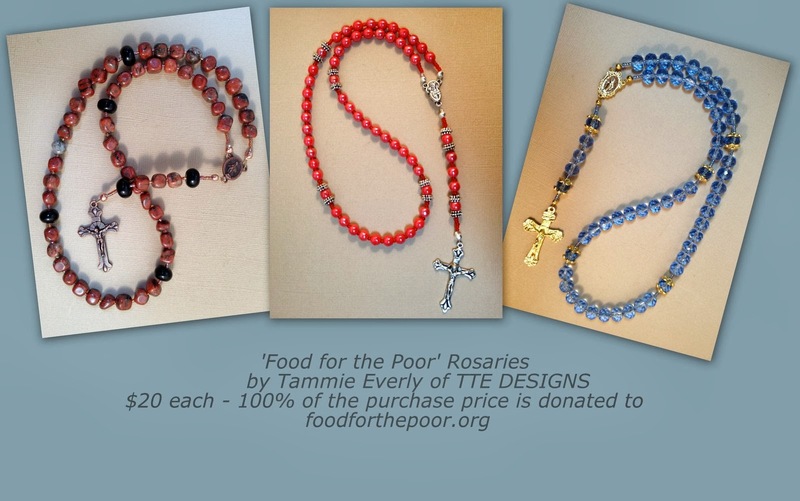 Happily, I sold my last two rosaries at the last two shows I did, so I have made 3 more and will send in a donation at the end of the month in honor of Our Lady. If you would be interested in joining me in this devotion I would be honored. If you are interested in a rosary or cross, let me know. 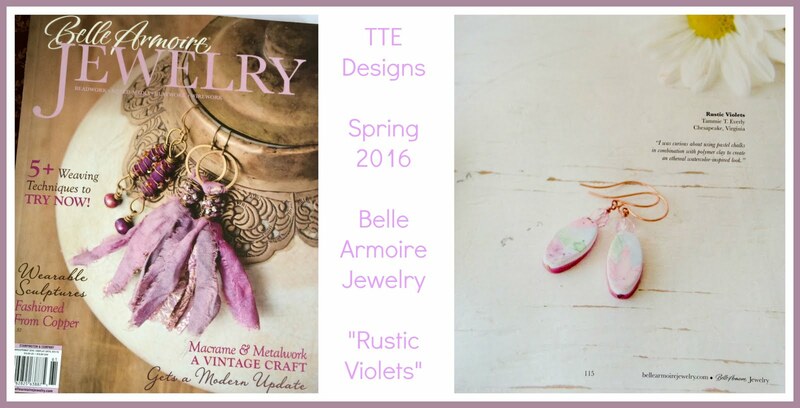 The three shown below are available on my TTE Face Book page starting today. Custom orders are welcome too. I somehow missed this post. In our current society we never really talk about religion..."it's just not done". But being silent about something so important robs people of the opportunity to learn and understand how religion works in normal, everyday people's lives. I wasn't raised with much religion except some pretty heavy handed fundamentalism in the community (I am from the Ozarks after all). So I avoided religion. But after I got divorced I wanted to find a church choir to sing in and a "home" to raise my kids in and got quite involved in the Episcopal church. Like you, the deeper I got, the more it all made sense. I'm sort of moving away from it again, but I appreciate what a place faith has in one's life. Thank you for sharing . It is a brave thing to talk about nowadays. BTW, you might want to consider making an Anglican Rosary (yes, Protestants have rosaries, too). They're not as popular, but in some ways that makes them more valuable when you do find a customer who wants one.